One of the things I’ve noticed about how the broad jump relates to overall athleticism is the correlation between broad jump distance and sprinting speed. Disregarding a few outliers, the vast majority of athletes I train that have what I would consider a good broad jump also display good sprinting speed. And if you take a look at this chart of 2013 NFL Combine results, you’ll notice that there’s a strong correlation between sprint times and broad jumps. It’s not a perfect correlation, but you can see that the majority of those athletes who have a broad jump of 120 cm or better run the 40 in the 4.3 to 4.5 sec range. Conversely, the athletes with a broad jump of less than 110 cm tend to run in the 4.6 to 5.4 sec range. When you think about it, this relationship makes perfect sense. The act of sprinting is really all about powerful hip extension, which propels the athlete forward. And the more powerfully you are able to extend your hips, the more force you can put into the ground, which will move your body forward more effectively. The broad jump is the most direct way to measure hip extension power, so it follows logically that somebody with a good broad jump should be able to run fast. One could make the argument that we can’t really say for sure whether the broad jump increases sprinting speed or vice versa, but it’s been my experience that even athletes that don’t spend any time working on sprint mechanics (or sprinting at all) tend to improve their running speed after training specifically to improve hip extension strength and power. On the other hand, athletes who spend the majority of their time developing sprint mechanics and running sprints don’t tend to improve their broad jump simultaneously. So it seems as though training to develop the broad jump also positively impacts sprinting speed, but not necessarily the other way around. In addition to running speed, the ability to powerfully extend the hips carries over to several other important sports movements. For example, hip rotation during a swing or throwing motion is actually accomplished by activation of the hip extensors, as shown by studies cited in this article by Jeff Albert. Really, any motion that involves hip rotation can be enhanced by developing the ability to extend the hips powerfully, including baseball swings, hockey shots, lacrosse… I dunno… “throws”, and tons of other movements. I haven’t started doing this yet, but I’m going to start measuring swing velocities and throwing velocities and compare them with broad jump results to see just how strong of correlation there really is. I think it will likely be a strong positive correlation, based on the fact that explosive trunk rotation is a major factor in swing and throwing velocities. There are several things to work on if you’re looking to develop a better broad jump and improve your athletic abilitites. Improving posterior chain strength is a good idea for any athlete. Exercises like deadlifts, pull-thrus, and hip thrusts develop the glutes and hamstrings, which are the engine around which athletes are built. High velocity exercises like speed deadlifts, med ball scoop tosses, and plyometric jumps all contribute to a good broad jump. Remember: strength is only half the equation. Without the ability to apply your strength quickly, most of your strength becomes useless in a sports setting. 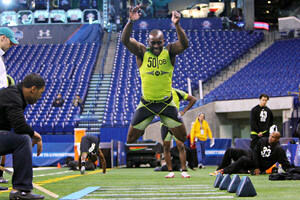 Like most sports movements, the broad jump requires a strong connection between the lower and upper body. Good athletes display the ability to transfer force from the legs to the arms and vice versa, which aids in overall power development. Core stability exercises like marching planks and palloff presses will increased the ability of the core to transfer force, which will lead to a more powerful overall movement. The broad jump doesn’t get a lot of love. It often gets shoved into the background in favor of the vertical jump, which everybody seems to be obsessed with, but it’s an important measurement of overall athleticism and athletic potential. So if you want to become a better athlete, try focusing on improving your broad jump for a while and I think you’ll be pleased with the results. Hi, my name is Max McGraw and am trying to improve my speed. So I tested my 40 yard dash and broad jump today. My broad jump was good at 10 feet but my 40 yard dash was a blistering…. wait… 5.2??? I don’t understand as I am very frustrated. I am 5’11” 170 pounds so I’m smaller too. I just don’t understand that I could have such a slow 40 time. What is up with that? Hard to say. Could be that you mistimed yourself or measured incorrectly, or your running mechanics could be bad. It’s also not a perfect correlation between broad jump and sprint speed, and outliers exist on any chart. Just wanted to share some personal experience after stumbling across this. I have had a 10’6″ or higher broad humor since my senior year high school. For whatever reason, I have a good vertical but not great (can dunk with two hands at 5’11.5″, but it’s a lot of effort) and I’m pretty fast when I run a lot, but certainly nothing special as like my broad jump would indicate. I played college baseball and had good power but an average throwing arm. I’m not very flexible, and I played hockey so my running mechanics are probably terrible, but I always found it interesting that I had this random skill that did not translate to anything else very strongly. A strong Broad jump can be heavily effected by the arm drive of the athlete. It has been my experience that a slower athlete with a strong upper body can post impressive broad jump numbers with a seemingly lackluster 40 time. Good call, Cory. I didn’t even think about that but you’re absolutely right.